Yaesu FTM-100 - digital dual-band car radio C4FM-FM, 144-430 MHz with support for WIRES-X System Fusion. C4FM radio Yaesu FTM-100 can work in digital and analog modes. Yaesu FTM-100 has a compact display with white LED backlighting of 160x40 pixels, and has a multi-color status indicator on the front panel. Yaesu FTM-100 has the function of automatic mode selection (AMS), which is one of the most famous distinctive features of System Fusion WIRES-X, it instantly recognizes what type of signal was received, analog or digital, and accordingly switches the modes of operation of the radio. 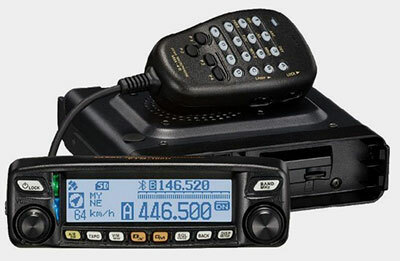 Other useful features are also available: Yaesu FTM-100 has the smart navigation, Digital Group Monitor (GM), location and ID control during data transfer, System Fusion, APRS at 1200/9600 bps, built-in highly sensitive 66-channel GPS antenna , the ability to record GPS data, voice guidance and recording function, a slot for Micro SD card and Bluetooth for hands-free calling.